Quote: Why do people without a watch look at their wrist when you ask them what time it is? As a reminder to anyone having this type of work done, it's important to take lots of pics for later records and interest, so, get snapping people you can't take too many. 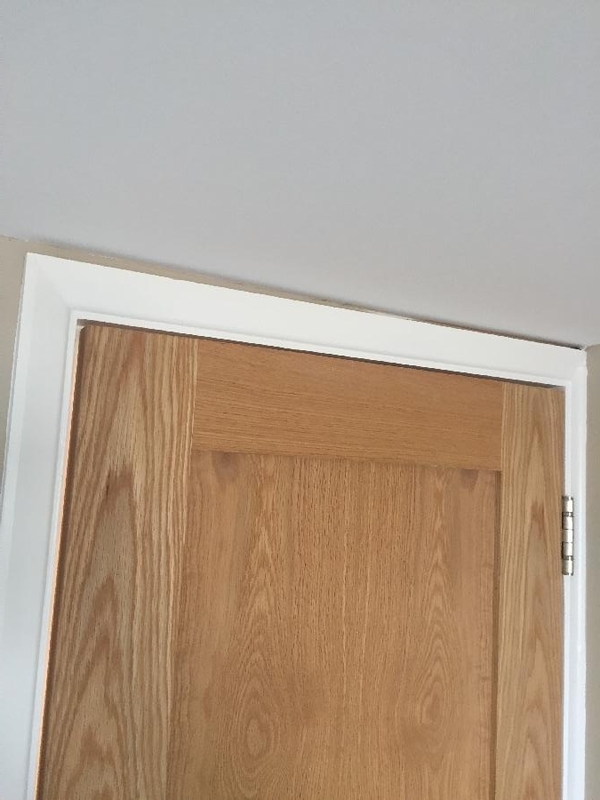 Which door frame in the second photo? Is it the one to the right through the first frame? If so, it looks like the flat roof (I assume flat roof?) has a fall on it as it should, although it’s usual to put the bottom of the beams in level, and add a strip to the top to introduce the fall. Can't see a lot of wood to hold the edge of the PB up. That looks like the cause to me. Perhaps they didn't fit a batten to the side of the joist so that corner of the board has sagged. Perhaps they did but it wasn't level. If the joists had dropped or buckled then you would see cracking in the paint on the architrave. The door would also not sit square in the door frame. However from the photos neither are obvious and so my take is that he got his levels a bit wrong with his studding. 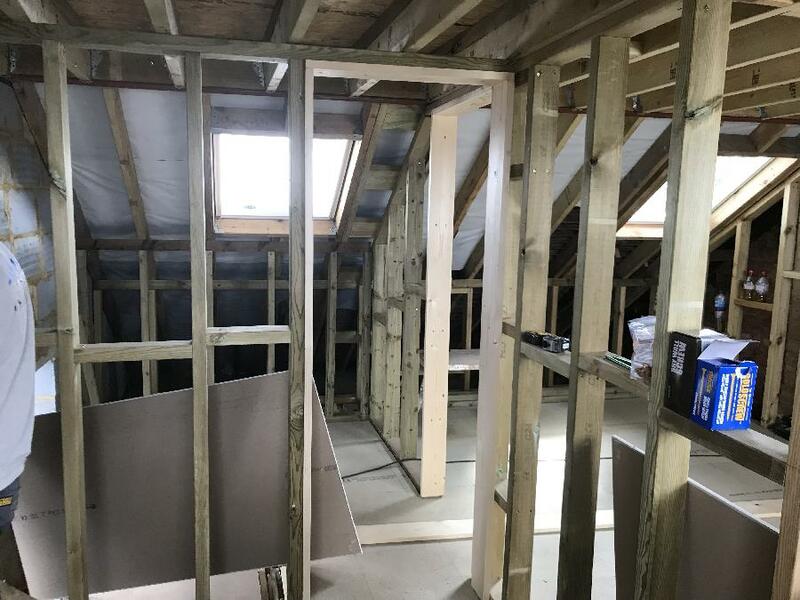 TBH it looks quite a tidy job although as Scruff has mentioned, you would expect to see some timber support between those ceiling joists on either side of that stud wall (where the door is) for the ceiling plasterboard to pick up and screw to. Otherwise it will flex constantly at that joint and crack. It's quite possible that he fitted some after the photo was taken. I wouldn't worry about it unless the 'other matter' that you refer to has an influence on what we're talking about. The only slight negative criticism is that the gap around between the door and door frame is rather large TBH. Aesthetically looks wrong. I assume that he fitted door stops at a later date ? Building Control aren't interested in levels (unless they are critically affecting the structure) or plasterboard for that matter. In the 2nd pic, the ceiling joist above the left side of the door is high, whereas the one to the right looks low and mostly hidden in the stud wall, making a good fixing for the ceiling suspect. Timbers don't come or stay straight, I wouldn't worry about it. Thank you. No these are the only ones I have. Sorry to be ignorant what is a PB? I don't know if he did the ceiling or walls first. Should I be concerned & if so should I pass this by the building regs chap? It has not passed because I asked him not to do so about another small issue. did he board the ceiling or walls first.? If he did the ceiling first have you the same pic showing it fixed. I don't know the size of the joists and will need to ask the builder. The builder initially said the joist has bowed and then when he came and looked at it he says that the ceiling runs very slightly out. To be honest I have lost a bit of confidence in them because of another issue but it has passed building regs but that chap was very easy going. I thought it may be the frame. If its the roof is that acceptable? Looks like the ceiling has dropped over the hinge side, is that correct? What are the size of the joists and the unsupported span? Does the photo help it is hard to get a spirit level to check because of the height of the door frame and ceiling. Thank you for all your replies I am having trouble uploading a photo but am working on it ! Without seeing photos it's hard to say what the problem is but I would like to think that if I was doing a loft conversion I would have found a solution that didn't look wrong. It's difficult to say for sure without seeing the extent of the problem but if your builder has fitted long (over 2.4m) joists without fitting herringbone struts, often called noggins, that could cause the floor and ceiling to distort. Hi I have just had a loft conversion completed and noticed one of the door frames and/or the ceiling is not straight. The builder tells me this is because the joist has bowed & has said he can't odds it with such long lengths there were bound to be a few out.